IBM WebSphere® eXtreme Scale provides a solution to scalability issues through caching and grid technology. It provides an enhanced quality of service in high performance computing environments. 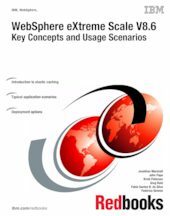 This IBM® Redbooks® publication introduces WebSphere eXtreme Scale and shows how to set up and use an eXtreme Scale environment. It begins with a discussion of the issues that would lead you to an eXtreme Scale solution. It then describes the architecture of eXtreme Scale to help you understand how the product works. It provides information about potential grid topologies, the APIs used by applications to access the grid, and application scenarios that show how to effectively use the grid. This book is intended for architects who want to implement WebSphere eXtreme Scale. The original edition of this book was based on WebSphere eXtreme Scale version 6.1. It was published in 2008 and described as a "User's Guide". This second edition updates the information based on WebSphere eXtreme Scale version 8.6, and covers key concepts and usage scenarios.